This article started out with a focus on the wonderful Hitachi leaf blowers (Gas Model: RB24EAP) but through the process of writing and researching this has become a guide to choosing the best leaf blower. And yes, we do cover Hitachi leaf blowers as well. There’s a lot of information for you to digest and consider when making your next purchase. It’s good to know your options before making your decision. We hope this guide will help you determine which leaf blower is best for you. If you have trees in your yard or even around your neighborhood then you are probably all too familiar with the chore that comes every year in the fall. It is called fall for a reason, as in the leaves from the trees, leaving you with a job to rake up. Let’s be honest; who actually enjoys raking the yard? Anyone? A leaf blower is a far more effective way of getting the job done. The Hitachi leaf blower is a popular and obvious choice for many homeowners, which will be discussed further in this article. There’s a lot this bad boy can deliver on. Owning a leaf blower offers many advantages and is even a necessity to those that take maintaining their yard very seriously. Clearing away unsightly debris from your yard year-round including pine needles, pine cones, etc. Leaf blowers come in many different forms that are designed to suit different needs from gas to electric and even battery-powered. They also come in a wide range of sizes from lightweight portable models that are easy to tote around to large backpack models that you strap onto your back. There are many different components to these various types of blowers that offer different needs including speed, convenience, and cost-effective. Choosing one that suits your yard and needs the most is a careful consideration. Includes a leaf vacuum kit, including a 1 bushel leaf vacuum bag. The most popular among these is the handheld leaf blower. They’re lightweight in comparison to the backpack models and perfectly capable of getting the job done. In fact, anything too powerful for the job can just stir up a bigger mess than what you started with. On the other hand, if you have some serious foliage to tackle then you will want something with the power capability to match the job. When it comes to power, you have a few different options. It all comes down to what you need it do, how much you are willing to spend and where you will be using. If you need something powerful for handling big jobs such as heavy, compacted piles of leaves and debris for instance, the power and efficiency of a gas-powered model is pretty hard to beat. These will get the job done quick and are completely portable – you can take it anywhere you need to without needing to be tied back by a power cord or worry about recharging a battery. You will need to take into account the area you live in as certain states have restrictions on machines and power tools that run on fuel. Because gas produces fumes that can be hazardous to the environment, states such as California require fuel-powered equipment to meet regulations set forth by CARB or the EPA. The classic Hitachi leaf blower RB24EAP model is a gas-powered handheld that meets these requirements. Gas blowers are powerful but they emit fumes, are heavy and noisy. There’s one more thing with gas powered models to mention that has to do with the engine. They are generally manufactured with either 2-cycle or 4-cycle engines. Those with 4-cycle (also referred to as 4-stroke) engines are heavier due to their engine makeup. In fact, these operate very similarly to most engines found in vehicles. A 2-cycle (2-stroke) engine gas blower, which is your more common gas model due to power performance over 4-cycle models, are actually lighter and cheaper to manufacture. One thing to keep in mind, however, is that with 2-cycle engines you will have to pre-mix the oil and the gas whereas with 4-cycle engines the two are added separately. And now, let’s look at the wonderful Hitachi RB24EAP — The customer satisfaction rating on this leaf blower is astounding. Don’t believe me, just read the customer reviews (over 2000 of them) and decide for yourself. Amazing 7 year warranty! High quality blower with high customer satisfaction. ✓ View or download the MANUAL for the Hitachi RB24EAP. Overall, this is a top recommended pick in leaf blowers with high reviews and a really great value for a gas-powered blower. This model features exceptional power and air velocity to move leaves and debris in a compact, lightweight handheld that is practical and easy to handle. Although it’s a gas model, it is designed specifically to put out low emissions for a CARB-compliant blower that reduces negative environmental impact. If you think this lightweight, low-emission Hitachi leaf blower leaves something to be desired in terms of quality and capabilities, think again! It is powered by a commercial-grade 23.9cc engine with a warranty of 7 years by the manufacturer for residential use and 2-year warranty on commercial use. A 7-year warranty is unheard of when it comes to power tools. Hitachi stands behind their products because they know they are built to last. Certified to the EPA’s highest useful life rating — 300 hours of use. This Hitachi leaf blower is built like a tank. Stripped down to the most important elements. It’s excels because of its simplicity. There are no bells and whistles on this model — what you see is what you get, which is one tapered nozzle that puts out an air volume of 441 cubic feet providing adequate removal of debris and leaves. It is everything you would expect of a typical leaf blower. As an additional note with gas blowers, this model is a 2-cycle gas powered unit so you will need to mix the oil in with the gas per the recommended ratio prescribed by the manufacturer. Remember to read the manual before using this Hitachi leaf blower or any other brand. Don’t assume you know how it works. Each manufacturer has their own requirements which you need to follow to maximize the life of your blower. Learn more about Hitachi by visiting their site. A well-balanced blower that won’t break the bank. 23.9 cc PureFire II two-stroke engine meets emissions levels. Lightweight (8.6 lbs) & well-balanced for comfortable use and less fatigue. Class-leading air volume at 441 CFM. 1.13 HP commercial grade engine for outstanding power and longer life. Produces an impressive air velocity of 170 MPH (with taper nozzle). Covered by Tanaka’s two-year commercial use warranty, seven-year consumer warranty and one-year rental use warranty. ✓ View or download the MANUAL or the PARTS LIST for the Tanaka TRB24EAP. If you happened to notice the model number of this brand is relatively identical to the Hitachi model above, that’s because they’re one in the same. Tanaka is a brand that has manufactured commercial-grade quality power equipment for homeowners and professionals alike for more than 80 years and is now a brand within Hitachi’s line of power equipment. 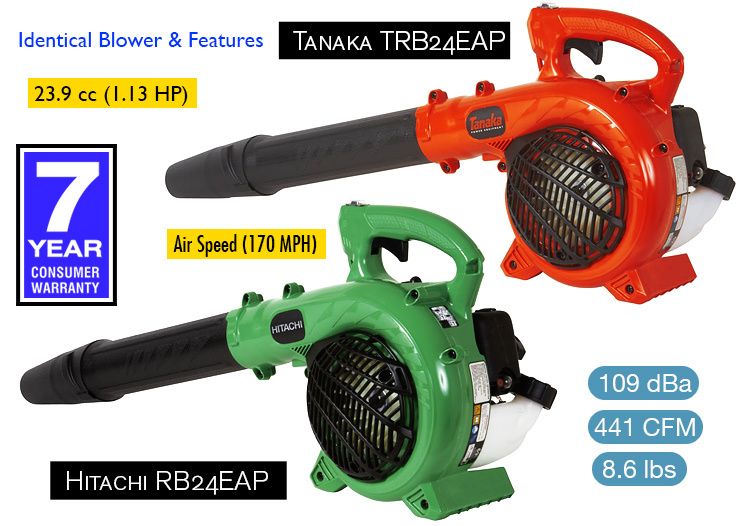 Other than the color (Tanaka is orange; Hitachi’s is green) and a slight price variation among different retailers, there really is no difference between this one and the Hitachi blower. Yes, these models are exactly the same. Unless you have a very strong color preference, if deciding upon these two models go with the one that is available for the lower price. They are both backed by the 7-year warranty for home-use, which is the best manufacturer warranty offered around on any leaf blower. You can also purchase the Tanaka THB-260PF model, which can also vacuum. This way, you get a 2-in-1 blower/vacuum, which ultimately gives you more flexibility when it comes to cleaning your yard. Includes vacuum kit with 10:1 mulch ratio. 27cc Full Crank 2-Cycle Engine. 2-in-1 combination blower and vacuum. QuickStart makes pull starts easier. Comfort over-molded handle absorbs and reduces vibration. Variable throttle with cruise control gives you more control. 200+ mph air stream (450 cfm air volume). This is a 2-in-1 gas blower with vacuum capabilities so you can not only ‘sweep’ the leaves and debris, but you can also use it to collect and vacuum it up. The reusable bag attachment is included and makes disposing of those unwanted leaves and yard debris a breeze (get it!?). The extended nozzle is designed to reach the ground so you can better operate the unit with greater control for blowing and vacuuming. It is a manual pull start but it is also equipped with Quick start technology for easy start ups when it’s cold. A translucent fuel tank allows you to see how much fuel (requires pre-mixing with oil) is left. ✓ View or download the MANUAL and PARTS LIST for the Remington RM2BV Ambush. Use the Remington blower for trees, shrubs, flower beds and hard-to-reach areas. Use the leaf blower around buildings, walls, overhangs, patio furniture, fences and screens, and for other normal cleaning procedures. Conserve water during times of drought by using your leaf blower instead of a water hose for many lawn and garden cleaning tasks — including things such as gutters, screens, patios, grills, porches and gardens. Enough power to keep your small yard clean all year round. Hold the blower with the right hand. Do not stand on the right side of the blower when using. The air intake is on the right side so you’ll block the air flow if you stand on the right side. This will affect the unit’s performance. Instead, simply stand on the left side of the leaf blower to maximize its performance and efficiency. Sweep from side-to-side with the nozzle a few inches above the ground. Slowly move forward, pushing the accumulated pile of leaves and debris in front of you. The majority of dry blowing operations around the home are better suited to low speeds, rather than high. Use the high speed to move heavier items like large debris or gravel. Learn more about Remington tools by visiting their site. These particular gas-powered leaf blowers offer more power capability than your typical handheld models. They generally weigh at least 17 pounds or greater, which is the purpose of the backpack straps for easier handling providing even weight distribution. These types of gas blowers are also louder than handheld models, but there are some models on the market that meet the noise limit* some areas restrict power tools to. 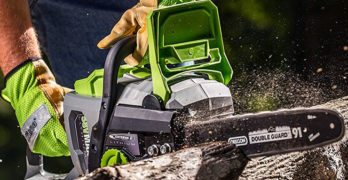 Many users that own a landscaping or yard work business can find these particular models beneficial over compact handhelds for their durability and power. Padded shoulder straps and ventilated back panel. 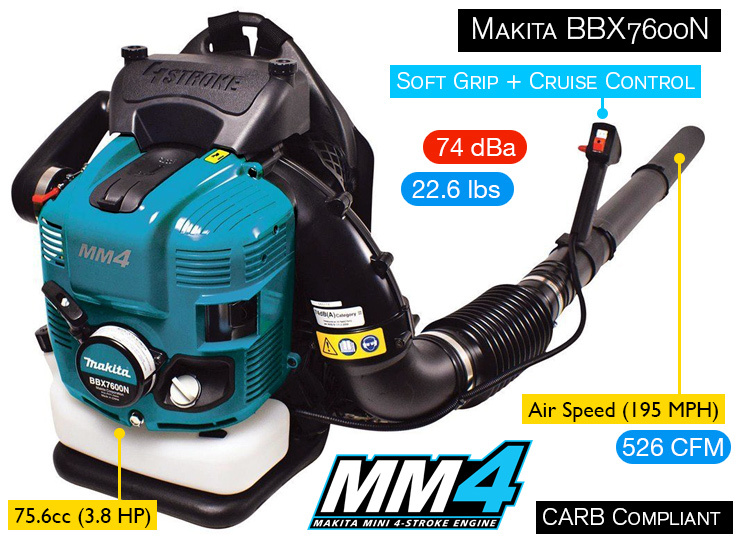 ✓ View or download the MANUAL or PARTS LIST for the Makita BBX7600N. If you’re going to be strapping on this bad boy then you clearly mean business! The 75.6cc gas powered backpack blower is equipped with a commercial-grade engine that really packs a punch with top air speed of 195 MPH. Whatever leaves and lawn debris in its path will be gone with the wind as soon as you start it. Because it’s a 4-cycle gas blower there is no mixing oil and gas required and produces lower fuel consumption for better fuel efficiency. The padded straps and ventilated back panel give it an added level of comfort to the user for smoother operation. 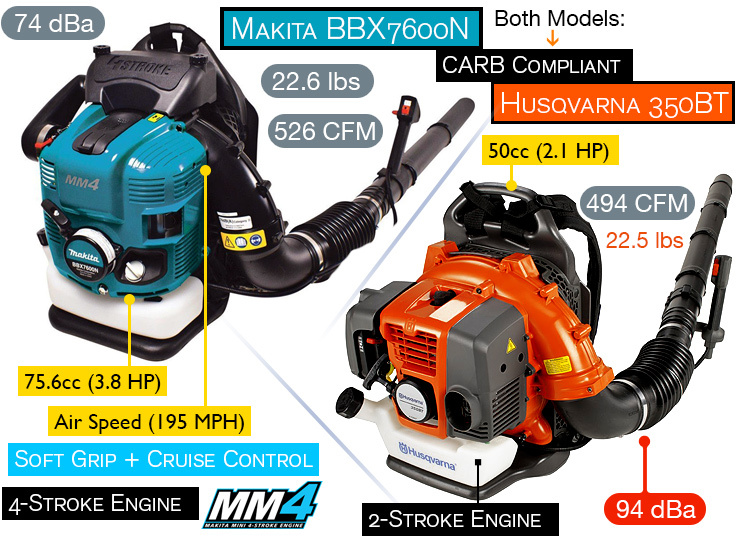 The Makita blower is superior to the Husqvarna 350BT, but also more expensive. Fuel Tank Capacity : 64.2 oz. Shipping Weight : 29.1 lbs. More torque than 2 stroke engines at low RPM. 2-stroke engines provide greater torque at higher RPM. Better Fuel Efficiency : 4 stroke engines uses fuel once every 4 strokes making them more efficient than 2-stroke engines. Cleaner, Less pollution : Because power is generated once every 4 strokes — and, no oil or lubricant is added to the fuel. Increased Durability : 4-stroke engine is more efficient, meaning it extracts more power from fewer cycles. Because a 2-stroke engine operates at a higher RPM it simply accrues more wear and tear in the same amount of time as a 4-stroke engine. No Need to Add Extra Oil : Only the moving parts need lubrication. No extra oil or lubricant is added to fuel. Disadvantages of a 4-stroke engine are: More expensive, more complicated design, less powerful than 2-stroke engines, and they’re heavier. Learn more about Makita by visiting their site. Models that are electric powered operate using electricity and consist of narrower nozzles for clearing hard-to-reach areas like window seals and light duty. Many of the high end models today, however, can match the power of a gas model to accommodate users looking for something for the seasonal heavy-duty tasks. Corded electric models require an electrical outlet source so these are most suitable for homeowners that have less than 100 feet of area they’re needing to clear. An example of ideal uses for corded electric models would be driveways and patios or small yards. One of the advantages to electric models is that they are quieter to run than units that are powered by gasoline engines. Therefore, hearing protection is not necessarily required while operating and your neighbors are less likely to complain (one can hope, anyway). While a corded electric has its limitations there is also the plus side to its ready-to-use capability, given electricity is available, without the need for refilling/mixing fuel or recharging a battery. There’s also no regular maintenance or fuel stabilizers required when storing it for long periods between use. 16:1 mulch ratio. High-impact metal fan helps reduce clogging. Blower is well-suited for : Clearing driveways, sidewalks, decks, and garages of debris and fall leaves from yard. Vacuum is ideal for : Vacuuming leaves, grass clippings, twigs, pine needles, and other lawn debris. 12 amp motor 3-in-1 blower, vacuum, and mulcher keeps the yard neat and tidy. With air speeds up to 250 MPH, this blower clears leaves and debris with ease. Variable Speed selections for flower beds and powerful enough for matted leaves. Easily change between vacuum and blower. ✓ View or download the MANUAL for the Black and Decker BV6600. This 12-amp electric leaf blower is actually an all-in-one model that features vacuum and mulching capability with a bag attachment for collecting leaves. It has a very powerful motor with maximum output of 250 MPH for heavy-duty jobs that require it as well as low speed capability for lighter jobs and delicate areas like flower beds. You can easily switch between blower and vacuum modes without any tools. The vacuum function is also quite heavy duty for picking up leaves, pine needles and even small twigs. It is well-constructed with a metal fan to reduce clogging with the mulching function and grinds to compact mulch at a ratio of 16 to 1. It is surprisingly very affordable for the power and quality this model has, offering a really great value to homeowners as well as business owners looking for a model with versatility. Very popular model with consumers. A battery-operated leaf blower, which are also called cordless electric, operate on a rechargeable battery so there’s no need for fuel or electricity source. These are much lighter in comparison to gas, which is helpful for handling larger yards plus there’s no heavy cord to lug around or maneuver around obstacles in the yard. You do need to charge the battery to run it and a fully charged leaf blower may last 30 minutes to over an hour just depending on the type of battery and power consumption of the model. If you do have a larger area to clear keep this in mind as you may have to take a break while the battery recharges to finish the job. A battery operated blower will give you sufficient power to clear away loose to slightly matted piles of leaves and debris, but it won’t meet the power of a gas model. These models are great for those looking just to maintain leaf fall and light to moderate debris. More than enough power. Quiet, no fumes or maintenance. Fantastic! Highly efficient Brushless Motor for long lasting power. Multi-speed fan control with TURBO boost. Features a Hyper-Stream air nozzle for extra tough conditions. Powerful 56V MaxLithium battery provides cordless convenience to quickly clean up your outdoor spaces such as decks or patios. ✓ View or download the MANUAL for the WORX WG591. *If you plan on using this blower for extended periods of time, consider buying a second 56V battery to eliminated down-time — WORX WA3555 56V (2.5 Ah Lithium-Ion Battery). This cordless electric blower features multiple speeds with a maximum air velocity of up to 465 cfm. The large air nozzle featured on the blower gives you more power to loosen up and clear away moderately tough matted-down leaves and debris with greater efficiency. You can adjust the speed to accommodate your needs for delicate areas such as flower beds, or crank it up to tackle on more heavy-duty jobs. The 56V Lithium-Ion battery included in this model comes with the charger and provides enough battery life to clear off a deck, patio, or driveway and yards of up to ¼ acre depending on the speed and nature of the job. The higher the speed set, the more juice it will consume. It has an ergonomic design for comfortable handling operation with one hand. The brushless motor gives you longer-lasting quality and it’s backed by a 3-year limited manufacturer warranty. Designed with a brushless motor for greater efficiency. Ergonomic and extremely lightweight. Easy to hold and maneuver. The DEWALT battery-powered blower also offers variable speeds. At the squeeze of a trigger it can handle light to moderate everyday tasks with a maximum airspeed of 90 MPH and features a trigger lock in speed. The 20V 5AH battery comes with the charger and it features a charge indicator on it so you’ll know when the battery starts to get low. 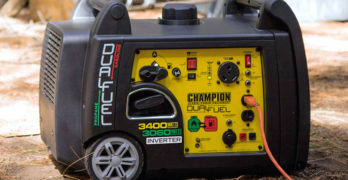 For an average-sized yard of about 1-acre and driveway with loose leaves or even wet grass the battery should last you about 25 to 30 minutes at full speed. Variable trigger and speed lock. The specifications imply that it doesn’t produce the amount of speed/air output as other models, but it’s sufficient for most jobs with a wider nozzle to move dust, leaves, and debris without excessive power that just stirs it up in the air. An added feature that adds to its durability is the battery cage that features a foot on the bottom as a means of protection against blow. If you want additional power for cleaning then consider the 40V DEWALT blower. It’s quiet, well-constructed and designed for power. Variable speed trigger and speed lock to give full power control. ✓ View or download the MANUAL or the PARTS LIST for the DEWALT DCBL790H1. Up to 400 CFM of air volume at 120 MPH to clear heavy debris. And for the ultimate battery backup blower then DEWALT has the DCBL590X1 (see below). You won’t find many battery backup blowers. Why? Well, because nobody makes them. Most are gas so this model from DEWALT is all the more impressive. It was released in the spring of 2016. Features an active second battery well for an additional battery. You won’t find a quieter backpack blower. Plenty of power for around your home and comfortable to wear. If you value convenience and quiet then you’ll love this DEWALT 40V backpack blower. High capacity 40V MAX* 7.5Ah battery with available second battery well for additional battery and extended run-time. Battery switch to select which battery well to draw energy from or to lock off the tool. Low noise during operation — 63 dB(A). Ideal for noise sensitive regions and properties. ✓ View or download the MANUAL or the PARTS LIST for the DEWALT DCBL590X1. **To learn more, read our in-depth guide focused on the Best Backpack Blowers. If budget is a factor then you will need to consider this when looking at different models. Overall, most gas-powered blowers cost more than electric models; although, this may vary based on brand and features. For instance, you can expect to spend approximately $35 to $150 max on an electric model, whereas gas powered blowers can cost you in the neighborhood of $60 up to $500! 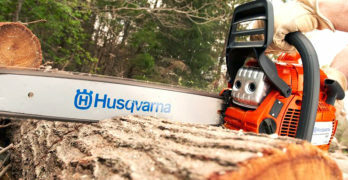 Husqvarna is a very reputable and well-known brand in lawn and power tools, but they also manufacture some of the most expensive gas powered backpack models in the industry. If You Buy A Gas Blower, You’ll Need Hearing Protection! You’ll need hearing protection if you buy a gas leaf blower. If long-lasting quality is something you strive for, the warranty may be a good implication of what you can expect. You will find that many gas powered models come with much longer warranty plans than electric. We’re talking years more; which can offer you longer protection. Another careful consideration is how frequently you will be using your blower. Keeping leaf accumulation and debris to your yard at a minimal is key to the health and longevity of your lawn. If you have a lot of trees around your yard and they frequently shed leaves, you certainly want a model that is more than capable of handling such a job so you aren’t left to clear leaves every day. **Be sure to check the regulations in your neighborhood or community regarding the use of power tools. Some areas may have restrictions regarding the noise levels with fuel-powered machines, while others may even ban the use of leaf blowers regardless of the type you intend to purchase. Always ensure a safe footing. Wear shoes/boots with a good grip and watch where you step. Never work on unstable surfaces or steep terrain. To reduce the risk of personal injury, never direct air towards other people. The high pressure air flow it emits can injure eyes and could blow small objects at great speed into sensitive areas. Do not insert any foreign object into the air intake of the leaf blower or into the nozzle. It will likely damage the fan wheel and can cause serious injury to you or bystanders when the object or broken components are blown out at high speeds. Pay attention to the direction of the wind (do not work against the wind). To reduce the risk of falling or losing control, never walk backward while operating the leaf blower. Always shut off the engine before cleaning or performing maintenance on the blower or attempting to replace any parts. Keep away from children at all times. This is not a toy and can seriously injure a child. Wear safety goggles and a dust filter mask if conditions are dusty. Wear long pants, safety boots and anti-vibration gloves for protection from dust and debris. Do not wear loose clothing, jewelry, shorts, sandals, etc. Loose clothing and jewelry can get caught by the blower causing damage to the unit and potentially injuring you. Never operate the blower when you are tired or under the influence of drugs, alcohol or medication. Wear hearing protection. Some blowers can get loud, especially gas models. Never operate a gas blower or any power tool, in an enclosed space. Do not use your gas blower inside your home, garage, barn, etc. Keep your hands away from moving parts or heated regions. Do not grab the blower/vacuum from the blow tube. Take breaks on a regular basis. Excessive vibration over long periods of time can cause Hand-Arm Vibration Syndrome (HAVS). Use anti-vibration gloves to protect yourself, especially if you’re using a gas blower. Chloroprene rubber palm pad. Lightweight, breathable cotton/nylon knit. Never leave the blower running unattended. Always shut off the blower first before placing it down or storing. Keep away from areas where your pets or other animals may accidentally stumble upon it. Read the instruction manual and follow the manufacturers recommendations. Only operate your leaf blower in good light and high visibility. Do not operate when it’s dark. During cold weather be aware of slippery or wet areas, ice and snow. We recommend using YakTrax if there’s ice on the ground. YakTrak PRO — Fits over your shoes. Simple and effective.